AURIN has released some new datasets from the Australian Capital Territory and Queensland governments, available now through the AURIN Portal. 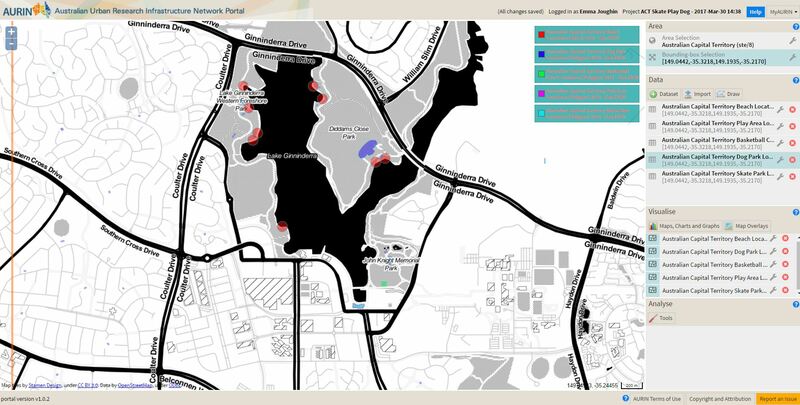 The Government of the Australian Capital Territory – Environment, Planning and Sustainable Development Directorate has supplied data to the research community via AURIN relating to public recreational land use. This data captured and maintained in the City Presentation, Transport Canberra and City Services Directorate (TCCS) asset database through the Works as Executed (WAE) process and field audits. Similar data for Queensland has been supplied by the Department of Natural Resources and Mining. Location of skate parks that are publicly managed by the ACT Government. These assets are managed by TCCS. Privately managed facilities and facilities managed by other ACT Government Directorates are not included in this dataset. Location of Dog Parks that are managed by the ACT Government. Parks and City Services established a reference group of key community and government stakeholders to ensure that the fenced dog parks were the best fit for Canberra and best practice in dog exercise park design. This reference group included representatives from a number of dog associations and clubs, the RSPCA, Centre for Companion Animals in Society, Australian Veterinary Association, Guide Dogs Association and Council on the Aging. Transport Canberra and City Services (TCCS) is responsible for the installation and upkeep of Dog Parks across the ACT. This dataset contains the location of Basketball Courts at local parks or open spaces that are publicly managed by the ACT Government and managed by City Presentation, Transport Canberra and City Services Directorate (TCCS). Beaches on urban lakes and waterways that are maintained for recreation and are managed by the ACT Government for public access. Natural, unmaintained beaches, privately managed facilities and facilities managed by other ACT Government Directorates are not included in this dataset. This purpose of this dataset is to provide the position and names of Recreational Areas for use in Land Administration,Topographic Mapping and in the production of Navigational and Web Based Mapping applications. Recreational areas include Civic Squares, gardens, golf courses, miscellaneous areas (e.g. basketball courts, bowling clubs, caravan parks, netball courts, tennis courts, velodromes , ovals, parks, race courses, racetracks, rifle ranges, showgrounds, zoos). Additional Information: This data has been compiled from numerous sources to produce a state wide coverage with the boundaries aligned in most cases with the Queensland Digital Cadastral Database (DCDB) r captured from the best available imagery with an attribute within the data describing the source and reliability. Source data include: Queensland digital cadastral database, Queensland regional mapping, Queensland orthophotography, satellite imagery, Geoscience Australia, community and government websites. For full details of this widely curated dataset please see our comprehensive metadata attached to the dataset in the portal. This dataset describes the position and names of camping grounds and picnic areas in Queensland. The location of the features was sourced from existing government topographic maps, regional maps and photogrammetric data. The features were then validated against current orthophotography and satellite imagery and modified where necessary. Features for ongoing data capture are sourced from government and community websites and National Park maps and their location is digitized from current orthophotography and satellite imagery. Additional data is supplied by Geoscience Australia as part of their 25K large scale data capture and commitment to the National Topographic Information Coordination Initiative (NTICI). In most cases these features have been identified through fieldwork by Geoscience Australia staff.